Russia may introduce criminal liability for bribing foreign public officials, as required by an OECD convention. However, experts point out that it is impossible to conduct business without bribes in some parts of the world. 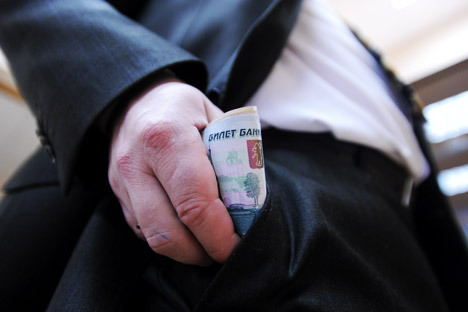 Bribing foreign public officials may become a criminal offense in Russia if the State Duma passes a law committing the country to the Convention on Combating Bribery of Foreign Public Officials of the Organization for Economic Cooperation and Development. If the convention is adopted, bribing officials abroad will be subject to criminal prosecution in Russia. Adoption of the bribery convention is a major condition for acceding to the OECD. Russia, which has been attempting to join the organization for a long time, has yet to bring itself in line with all the OECD’s standards. Experts warn that if the convention is adopted, certain countries and even entire continents will be off limits to Russian business. “Naturally, one has to follow the rules existing in each specific country. In Africa, for example, corruption goes beyond all conceivable limits and, unfortunately, it is impossible to conduct business there without greasing somebody’s palm. The situation there is much worse than in Russia. Naturally, if Russian businessmen do not offer bribes, they will not have any business there. In Europe and America, there is no corruption, so let’s do something about Africa, or leave the continent altogether,” said Vladimir Skripnichenko, CEO of the Center for Study and Assessment of Legal and Economic Problems of Business. In keeping with the international anti-corruption convention, Western governments have repeatedly had to punish their businesses for bribing Russian officials. In September 2004, French authorities suspected the oil company Total of giving bribes in Russia and Iraq to obtain contracts. The company was reported to have spent $20 million on bribing officials in these countries between 1996 and 2001. The investigation was continued only with regard to Iraq, however. On Nov. 15, 2006, the German prosecutor’s office accused the telecommunications division of Siemens of paying 77 bribes totaling €12 million ($15 million) to officials in Nigeria, Libya and Russia. In Russia alone, 38 high-level officials from dozens of regional state companies received €2 million ($2.5 million) from Siemens. The German industrial giant was fined more than €200 million ($253 million) as a result. In March 2010, the U.S. authorities accused the German car manufacturer Daimler of bribing officials in 22 countries, including Russia. Daimler’s Russian clients included the Ministry of the Interior, the Defenze Ministry, the Special-Purpose Garage of the Federal Protective Service, and the government of Moscow. The company, which had dished out $5 million to bribe-takers to obtain contracts, had to pay a $185 million fine to put a stop to the judicial inquiry. First published in Kommersant FM.